Sunshine, sand, and surf greeted participants of the 2018 LTER All Scientists’ Meeting as they arrived at Asilomar Conference Grounds in Pacific Grove, California. 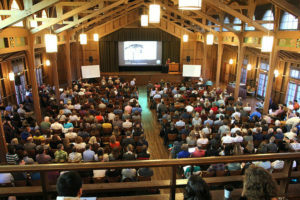 For four days, Asilomar was abuzz with the excitement of nearly 600 people sharing new scientific ideas and discussions. An ASM poster session in full swing. Nearly 300 posters were presented over 2 sessions. The theme of the 2018 meeting, Next Generation Synthesis: Successes and Strategies, encouraged attendees to think about how data and research approaches across the LTER network can be synthesized in new, innovative ways to answer pressing ecological questions. Several of the plenary speakers described ways that LTER research could provide key insights into complementary research networks. During the preparatory committee meetings, LTER site principal investigators were treated to a series of short, videotaped presentations from current synthesis groups. Those presentations are now available to all on the LTER Network YouTube Channel. Kathleen Weathers, Global Lake Ecological Observatory Network (GLEON) Steering Committee Co-Chair, emphasized the important role of LTER scientists in the evolution of lake ecosystem research, and Sharon Collinge, Director of the National Ecological Observatory Network (NEON), described how many NEON researchers have their roots in LTER and have a deep appreciation for long-term research. Similarly, Ben Halpern, Director of the National Center for Ecological Analysis and Synthesis (NCEAS) spoke about the opportunities for LTER researchers to collaborate on open data and ecological research initiatives. A view from above – it was a full house for the first plenary session of ASM 2018. Attendees also had the opportunity to hear from National Science Foundation representatives Terrence Quinn (NSF Division of Ocean Sciences Director) and Stephanie Hampton (NSF Division of Environmental Biology Director) about upcoming funding opportunities focused on integrative and interdisciplinary science, big data, and other forward-looking approaches to ecological research. 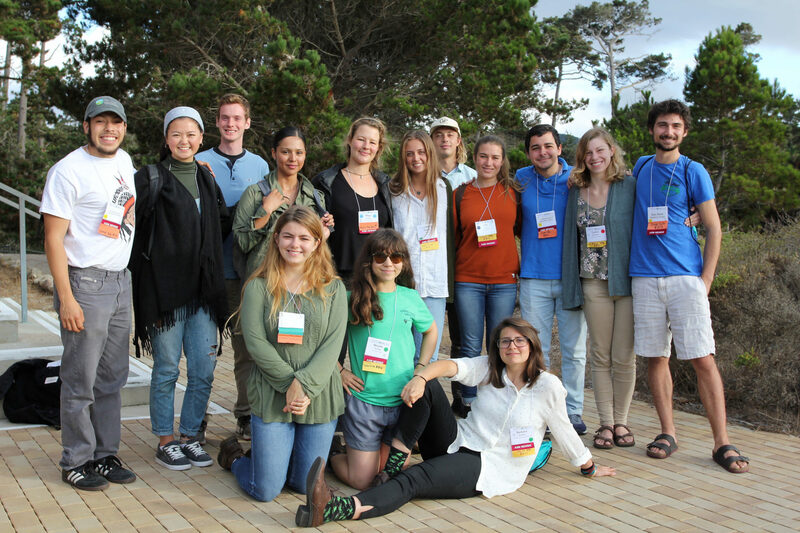 With nearly 100 workshops and events — not to mention the constant temptation to slip down to beautiful Asilomar beach — the 2018 ASM was jam-packed with opportunities to learn about research and education activities occurring across multiple sites, learn new skills (like programming drones or making science videos), and develop collaborations. The inaugural LTER Idea Cafe was an entertaining evening featuring 17 pitches for exciting new research and outreach initiatives — with some interpretive dance, dramatic readings, and a time-traveling gold miner thrown into the mix! The meeting was particularly beneficial for LTER graduate and undergraduate students to interact with their peers, meet various site PIs, and participate in community-building activities throughout the week. The LTER graduate representative committee took the reins on making sure early career participants had ample opportunities to network and build their skills throughout the ASM, from lunchtime table conversations to science bingo and a hugely popular trivia night. The LTER Communications Committee was honored to present the very first Arthur Schwarzchild Award for Best Undergraduate Poster to Nicolle Omiotek (Luquillo LTER), and second place to Harry Ervin (Kellogg Biological Station). Third place was a tie between five students: Zoe Bergman (Jornada Basin), Bobbi Bevacqua (Bonanza Creek), Julia Cox (Northeast U.S. Shelf), Jennifer Holguin (Sevilleta) and Alex Wells (Sevilleta). A cohort of impressive LTER REU students was selected to attend ASM 2018 and present posters. On behalf of the LTER Network Communications Office, we hope that all ASM participants had a rewarding experience. To see more meeting photos (and upload your own) visit our LTER-NCO Flickr page. The full conference schedule and workshop descriptions are still available on Sched. We value your feedback – if you attended ASM 2018 and haven’t yet filled out a follow-up survey, you can do so at this link.